Officers outside the Ocean View Church of Christ meeting to discuss the active shooter exercise. 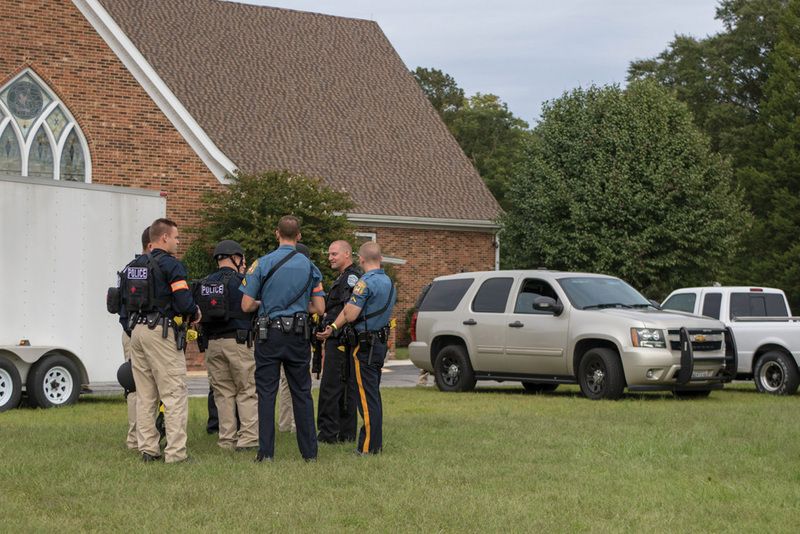 On Oct. 13, agencies across southeastern Sussex County participated in an active shooter exercise. “It’s so important to make sure when we practice things and train that that’s exactly what happens in real life,” said Sgt. Richard Bratz, Director of Public Information for the Delaware State Police. “We can see where all our strengths are, find areas for improvement and increase our communication with everyone. Set up and run by The Olson Group at the Ocean View Church of Christ, the scenarios allowed officers and paramedics to use their Rescue Task Force Training. “What we’ve learned from events like Columbine and Virginia Tech is more lives are lost because EMS is waiting so long to go in,” said Matt Farlow, a paramedic with the Sussex County Paramedics. “The old style was, police would go in while medics and fire would stage somewhere else away from incident in what they would consider a safe zone. They would wait until all shooters were down, confirm the building was empty and then send EMS in. By that time, for many people, it was too late. 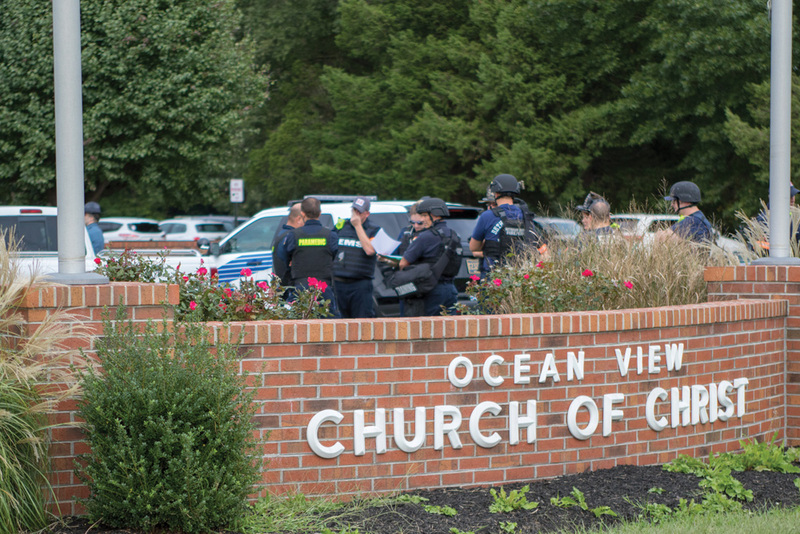 Agencies participating in the drill included the Ocean View Police Department, Bethany Beach Police Department, Millville Volunteer Fire Company, Bethany Beach Fire Company, Sussex County Paramedics, DEMA, Ocean City, Md. Emergency Management. Funding from Homeland Security paid for the multi-agency exercise, which the Ocean View Police Department began planning in February. “This is so much work — hours and hours into just the planning to pull it off ,and then it’s over in a few hours,” said McLaughlin, noting that OVPD Administrative Officer Russell Carter did a great deal of work to organize the exercise. During the course of the exercise, which ran from 1 p.m. to 4 p.m., two separate scenarios were acted out, with emergency personnel responding with little to no information. While emergency personnel do work together from time to time, the exercise was an opportunity for agencies to come together on a larger scale. Sussex County’s Emergency Operations mobile command unit was also on-scene participating in the event. 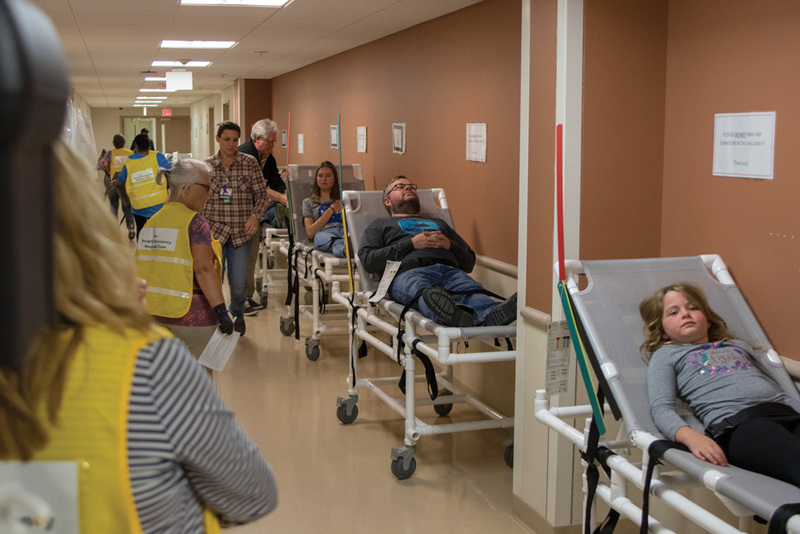 Beebe Healthcare’s emergency room in Lewes also ran behind-the-scenes simulations in conjunction with the training. 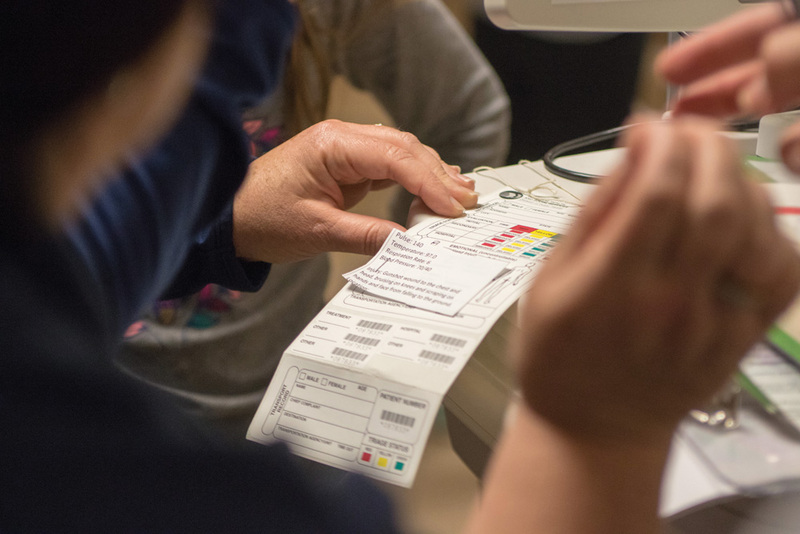 Cheryl Hopple, Beebe’s emergency care coordinator, said the hospital plans and executes two drills twice a year for accreditation. 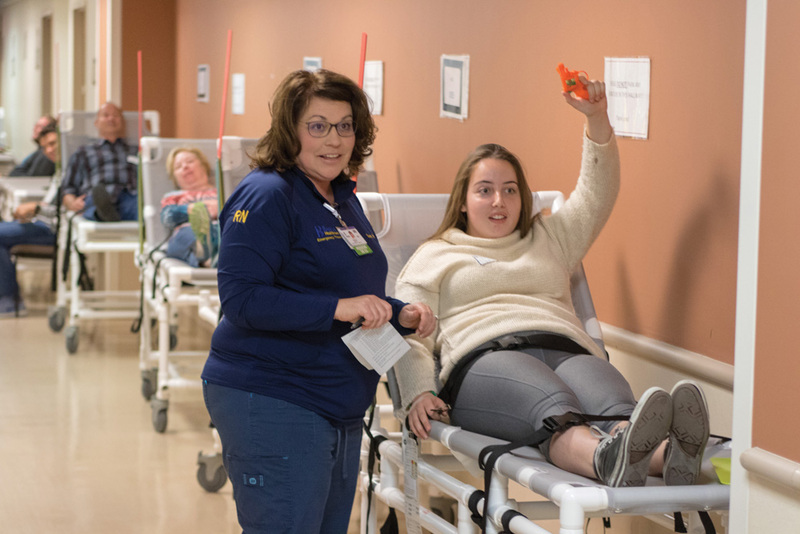 At Beebe, there was a simulated influx of victims varying in age and injury, one of whom was concealing a fake gun that they would later discharge as part of the scenario. Hopple said the hospital pays for all employees to be trained in ALICE — Alert Lockdown Inform Counter Evacuate — a technique that gives bystanders the opportunity to act instead of wait in an active shooter situation. “It gives people options to help them save their lives, and the lives of the people they’re caring for,” she explained. Hopple said while Beebe has a no weapons policy, often weapons are carried into the Emergency Department. While an individual may legally be permitted to carry a gun, Hopple said it is for the safety of all persons in the hospital for them to be prohibited. During the exercise, members of Beebe’s Emergency Response Team tested their training and equipment. Melissa Markham, Quality Assurance Coordinator for Beebe’s clinical laboratory, is one of about 25 employees on the volunteer-based team. Markham said the team is able to receive all levels of emergency training, and meets about eight times a year. “Sometimes it’s working meetings — we’ll go down to the cage, where all this equipment is stored in a locked area. We’ll take inventory or get new equipment in,” she said, noting that through trainings they’ve been able to add essential supplies to their emergency kits, like baby and adult diapers. 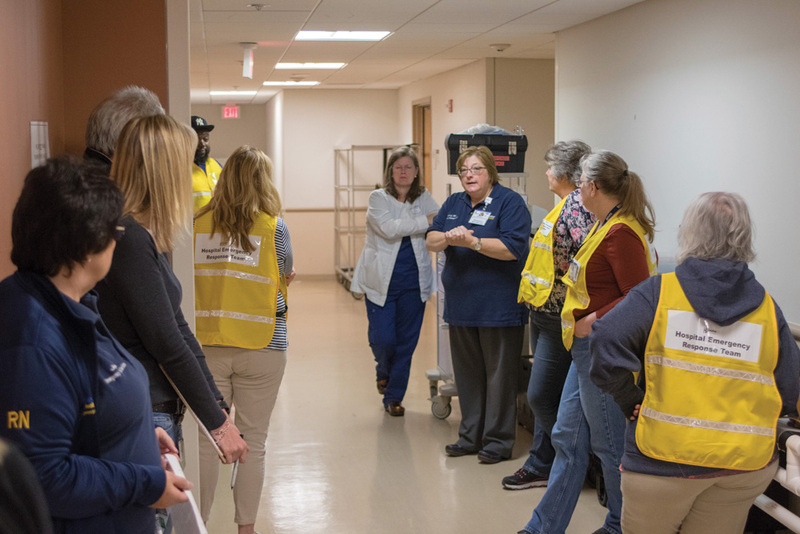 Hopple said during the exercise, the team is able to evaluate equipment — like the 10 new overflow beds the hospital purchased. With the exercise complete, McLaughlin said there were a few meetings following to review, with an official after-action report expected in the coming weeks. Training together is key, said McLaughlin, noting that OVPD conducts similar exercises on a smaller scale throughout the year. “We have an obligation to the community to make sure they know we’re doing everything we can, so God forbid if something like that were to happen in our community we’re prepared to respond to it.